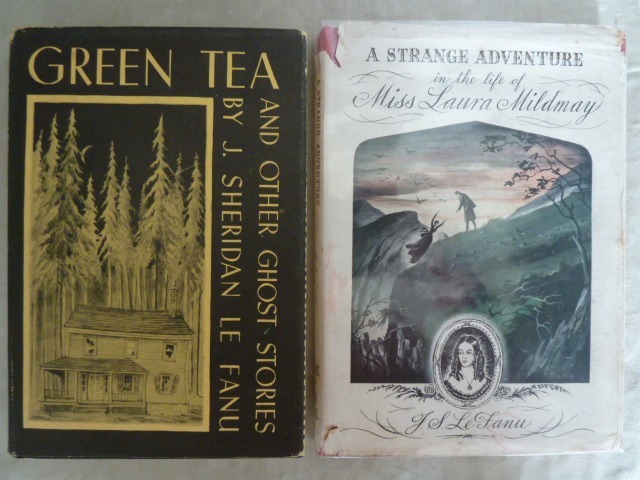 Those fortunate enough to have read the excellent anthology "Fifty Years of Ghost Stories" during childhood will have soon encountered two stories by J Sheridan Le Fanu, the man M R James considered the supreme writer of ghost stories - 'The Familiar' and 'Green Tea'. In the former, the unfortunate Captain Barton is pursued to his death in his own bedroom by a vengeful revenant; in the latter the Reverend Jennings is haunted by a monkey, the appearance of which is attributed to excessive consumption of green tea, and driven to suicide. 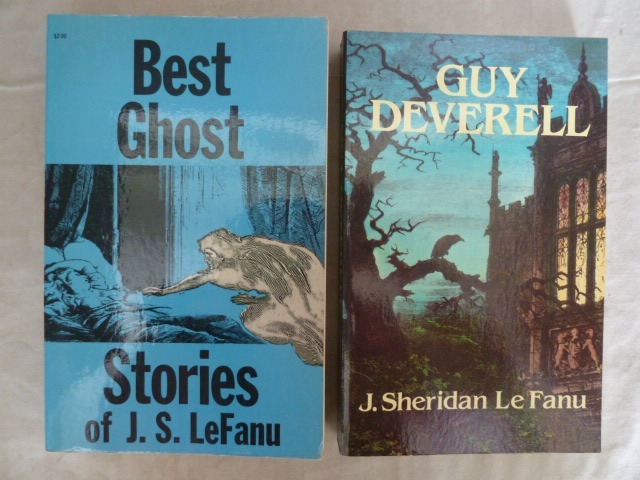 Both are powerful stories and these alone would place Le Fanu high amongst writers of supernatural fiction. However, add to these the unforgettable 'Carmilla', most frightening of all vampires, and 'Schalken the Painter', in which the terrified Rose Velderkaust, forced into marriage to a repulsive stranger by her uncle in return for a large dowry, returns from her wedding night to reveal she has been married to a dead man and Le Fanu is seen, as M R James noted, to be absolutely in the first rank of ghost story writers. I read most of these stories in 1960's in the Dover editions edited by E F Bleiler. 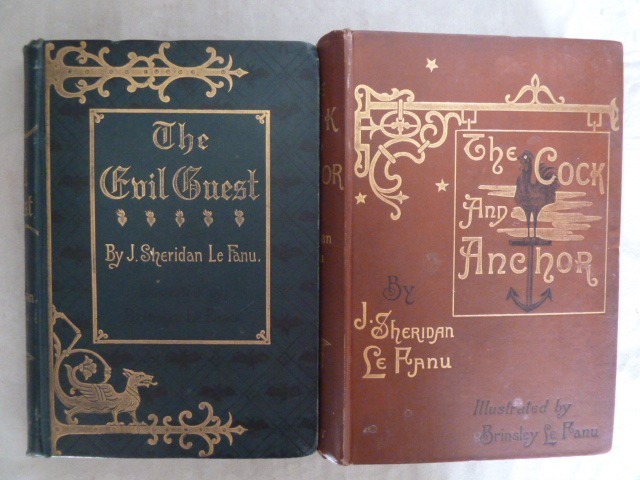 However, for those seeking Le Fanu's stories of the supernatural for the first time I would turn to the three volumes edited by Jim Rockhill and published by the Ash-Tree Press. 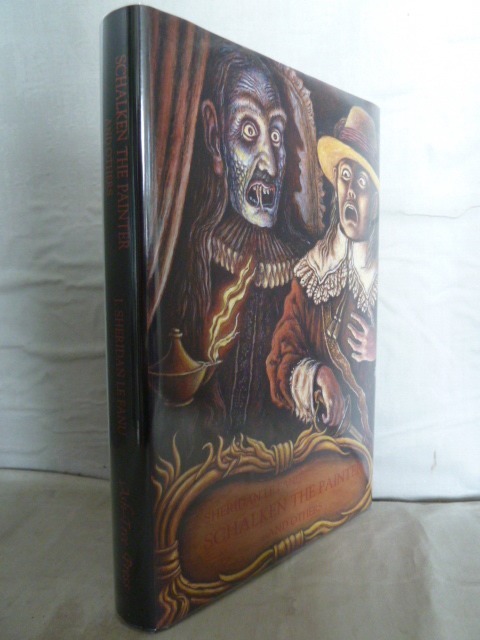 In addition to forming a comprehensive set of the ghost stories, the Ash-Tree Press books are themselves beautifully produced and a delight to read and handle. 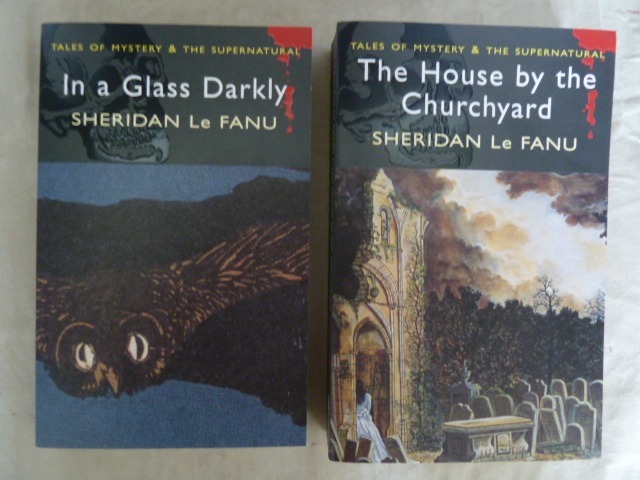 Le Fanu's powers as a ghost story writer reached their peak in "In a Glass Darkly", published in three volumes in 1872, the year before his death. 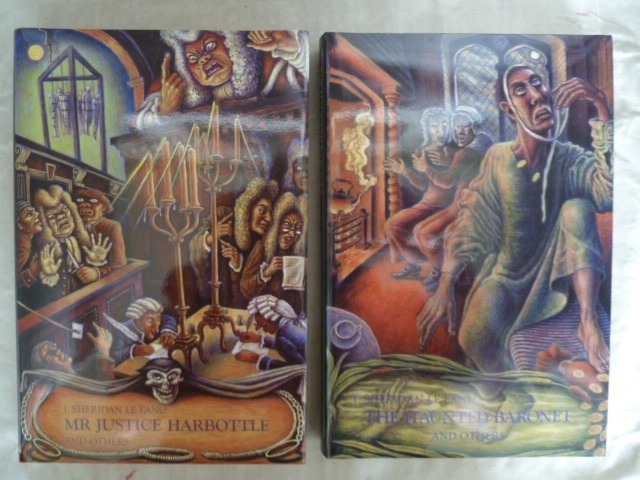 This includes 'Green Tea', 'Carmilla' and, another of my favourites, 'Mr Justice Harbottle', in which a hanging judge is subjected to his own frightful supernatural judgement by one of his victims. In addition to his short stories and minor writings Le Fanu wrote fourteen novels, the most celebrated being "Uncle Silas" and "The House by the Churchyard". 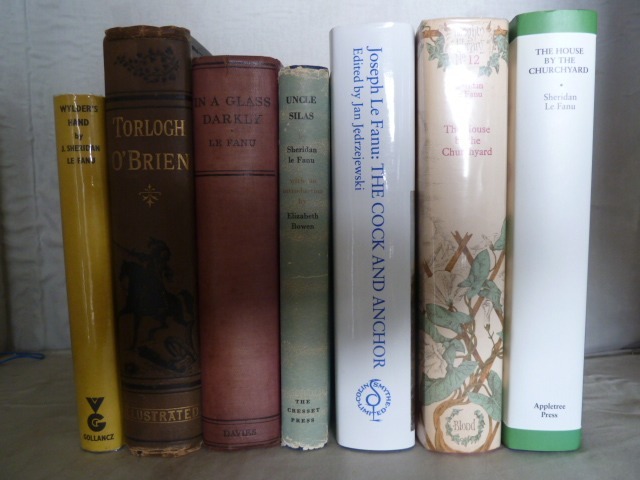 As was customary for the time, the novels were generally first serialised in the popular magazines - "All the Year Round", "Dublin University Magazine", "Temple Bar". "Uncle Silas" picks up a recurring theme in Le Fanu - vulnerable young women entrusted to the care of people who wish them harm by (not always) well-intentioned fathers, mothers or brothers. In "Uncle Silas", it is her dying father who, seeking to be reconciled with his estranged brother, passes Maud Ruthyn into the 'care' of her uncle, who plots her murder in order to inherit her fortune. 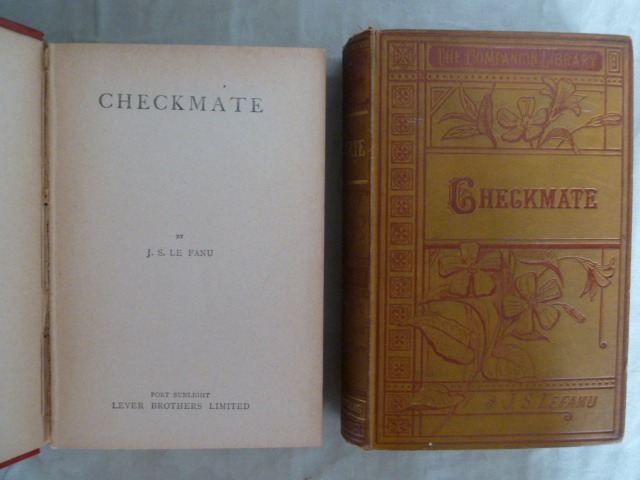 In "Checkmate" it is Alice Arden's brother who attempts to force her into marriage with the villainous Mr. Longcluse. However, the ultimate betrayal is found in my personal favourite - "The Rose and the Key", in which it is her own mother who commits Maud Vernon to an asylum, again in pursuit of her daughter's fortune. The tension mounts remorselessly as Maud slowly realizes that the country house she thought she was visiting is, in fact, a lunatic asylum and sees her desperate attempts to escape taken as further proof of her madness. 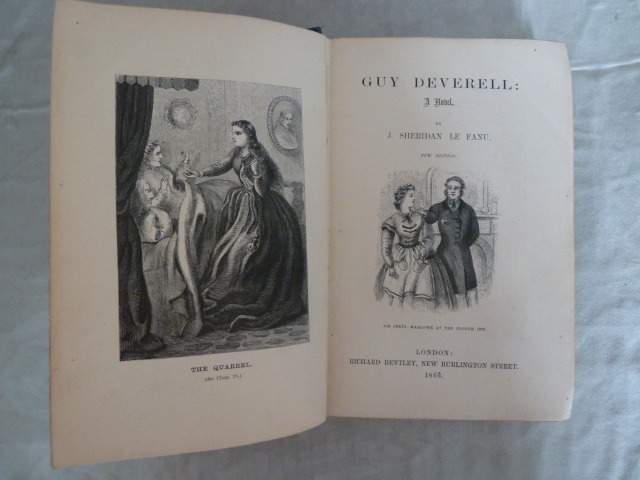 The original three volume editions of the novels are now impossibly scarce and, commensurate with their rarity, very costly. I do have the first two volumes of "The Tenants of Malory" and that, I fear is as close as I will get. 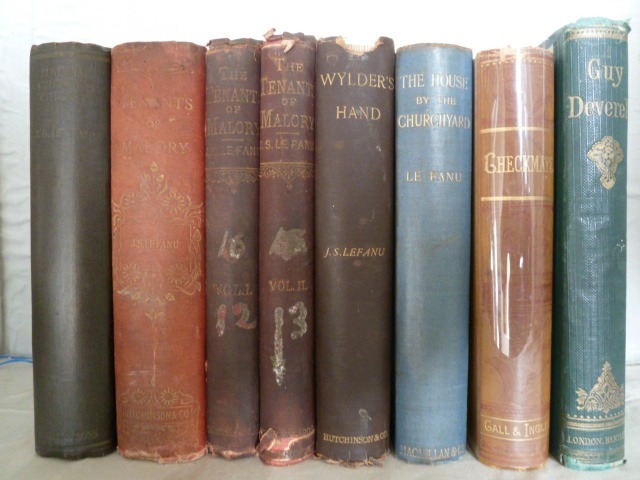 However, single volume editions published later in the nineteenth century can be found and those published by Downey and Company form a particularly attractive set. 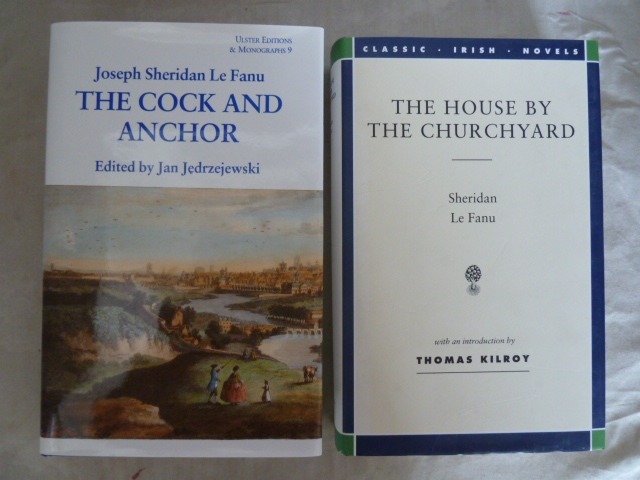 New editions of other novels also appear from time to time, sometimes under Irish press imprints. 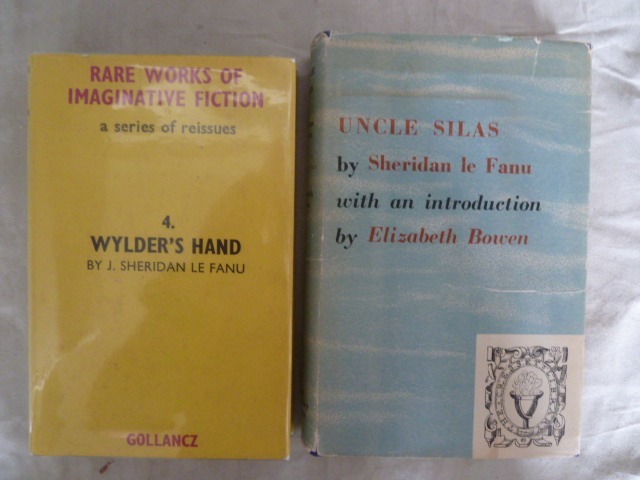 A set of Collected Works in 51 volumes was produced by the Arno Press of New York in 1977, but to date I have only located two of the three volume novels, both ex University of Arizona. 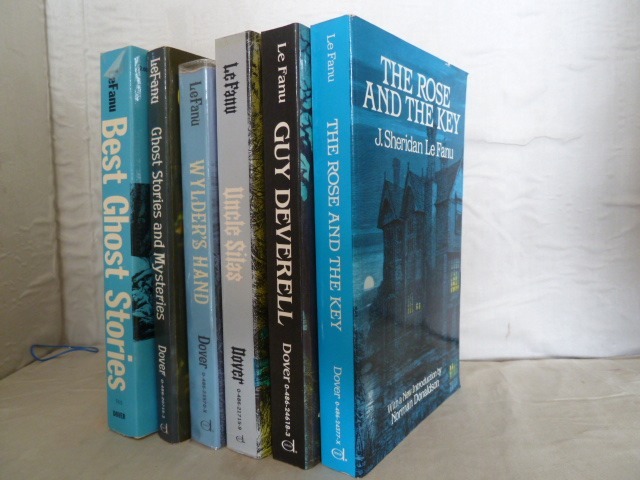 Paperback editions of the more popular novels and short stories have been produced in recent years by, amongst others, Alan Sutton, Nonsuch Publishing and Wordsworth Editions. 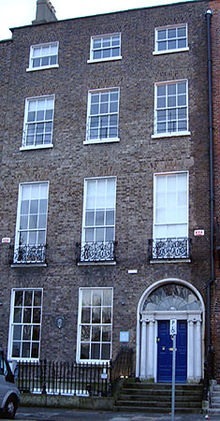 "The House by the Churchyard" is justly famous, not only for its complex plot and wonderful evocation of Chapelizod, but also for the fact that the young James Joyce found a copy of the book in his father's library and later used elements of its plot and descriptions in "Finnegans Wake". In Le Fanu's work a crime is committed in Phoenix Park and this is mirrored in "Finnegans Wake" by Earwicker's encounter with the two women at the same location, which event brings about his fall and loss of reputation. 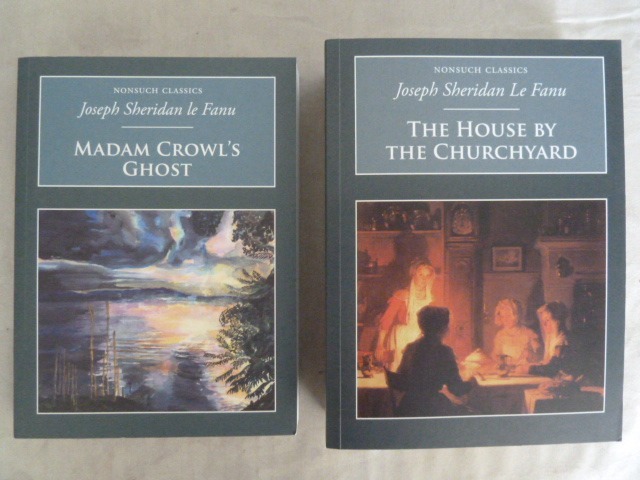 In addition, there are three references to "The House by the Churchyard" in the Wake that show how much Joyce admired Le Fanu's novel; these appear as 'Lefanu (Sheridan's) Old House by the Coachyard', 'The old house by the churpelizod' and (in Dutch) 'De oud huis bij de kerkegaard'. 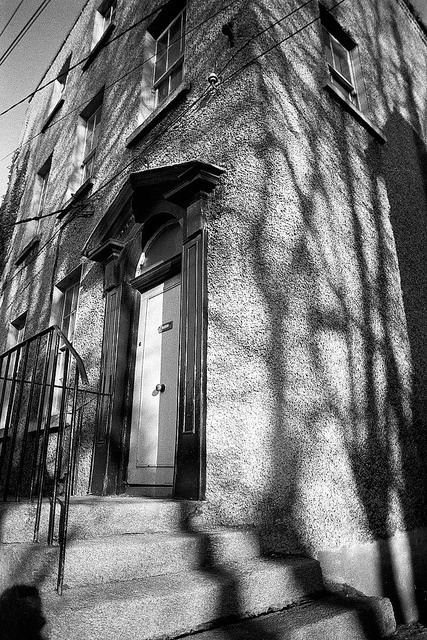 Having stood outside the house in Chapelizod, which was the inspiration for Le Fanu's work, on a cold grey December afternoon, I can well imagine what ghosts the building conjured up in the author's mind. It was M R James in 1923, who cemented Le Fanu's reputation by his editorship of "Madame Crowl's Ghost and other Tales of Mystery", to which he added a useful prologue and an excellent bibliography. MRJ also contributed the introduction to the OUP World's Classics edition of "Uncle Silas". 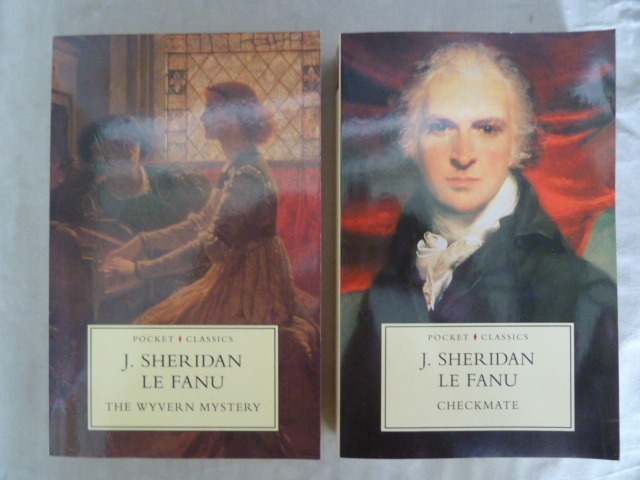 In recent years there has been a welcome increased interest in Le Fanu, spearheaded by Brian J Showers at the Swan River Press, Gary W Crawford via the on-line journal "Le Fanu Studies" and Jim Rockhill. Le Fanu, the son of a Church of Ireland priest was born in 1814 in Dublin, where he spent much of his life - from 1856 to his death in 1873 living in No. 70 on the fashionable Merrion Square. From 1861 he edited the Dublin University Magazine, in which many of his works first appeared and to which he began contributing in 1838, with the short story 'The Ghost and the Bonesetter'. Affected by the early death of his wife, Le Fanu was attracted to the writings of the Swedish philosopher Swedenborg, whose visions of Heaven and Hell may have influenced Le Fanu's work. Indeed, the popular image of the mature Le Fanu is of a tormented recluse emerging from his house on Merrion Square late at night to wander the streets of Dublin, pursued by the phantoms of his own nightmares. This does not quite square with the life of a busy editor and man of letters, but I do like to think that Le Fanu's ghost still paces the silent city streets deep into the night when all human traffic has ceased. And even in broad daylight, I have felt a shiver when walking along Aungier Street and remembering the 'strange disturbances' that afflicted a house on that Dublin street in Le Fanu's story. this is one of my favorite writers, I read regularly "the house by the churchyard". I have all his books have been translated into French. 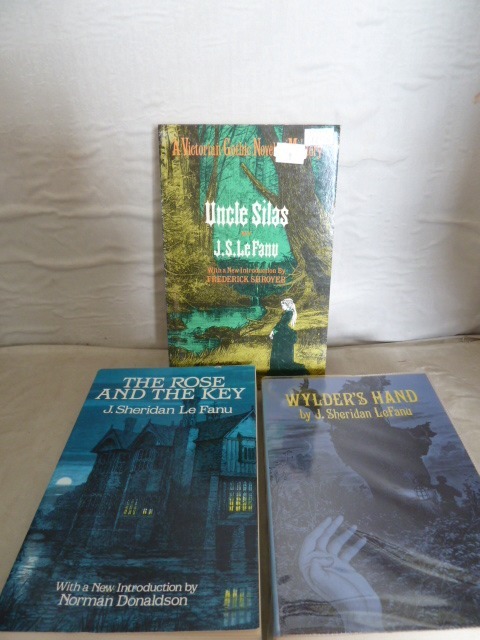 Uncle Silas is the prototypical Gothic romance, and his ghost stories are some of the finest ever written, admired even today. Carmilla preceded Dracula, just as effective and possibly influenced Bram Stoker. 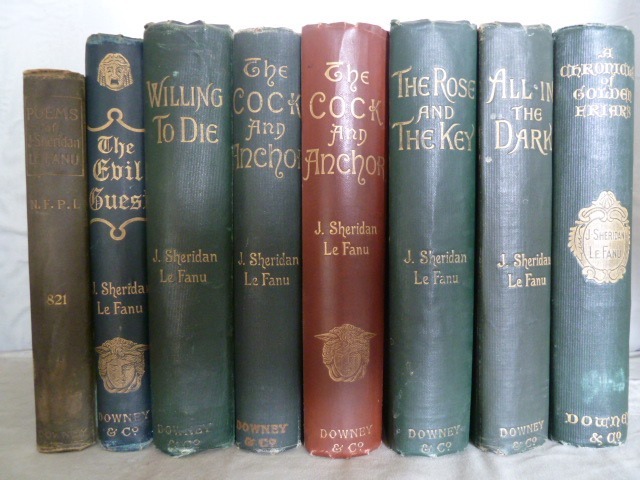 Le Fanu had a descriptive writing style, modern for its day, plus a realistic approach to the supernatural. Like Poe, he wrote what sold but gave it a high literary quality. Sadly neglected author. Thank you for the comment. I agree with your views. Le Fanu does have a small but select group of devotees. Worth you checking out Swan River Press run by Brian Showers in Dublin who keep his memory very much alive.